The Jazz have done it again. Their 2nd round drafting prowess has proved miraculous. 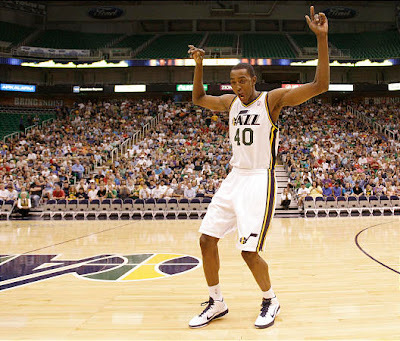 Jeremy Evans has been a welcome addition to the Jazz roster after playing his way onto the team during the pre-season. Nobody expected it to happen. No one had heard of him coming out of Western Kentucky. But, here he is... making all of us (so called) draft experts look bad. The pogo-stick leaper has been electric during the pre-season. He's played to his strengths (rebounding and garbage-man hustle plays) and provided the team with a boost of athleticism that has been desperately needed. It should be interesting to see if he'll be able to break the regular season lineup. I can't wait to see his 1st alley-oop dunk! 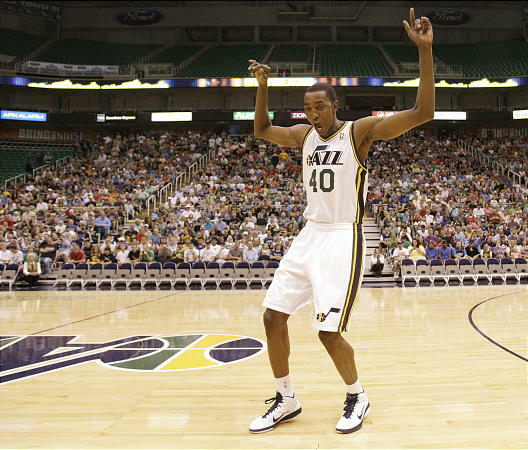 The Jazz need to be calculated and intelligent as they move forward with Evans. We ought to sign him to a low-cost, 3-year deal, similar to what Millsap got when he was drafted. Evans' has the abilty, athleticism, and attitude to contribute and improve our team. I'm excited to eventually see how he progresses. It was a sad day to see our reserve hopefuls get cut from the team. Sundiata, Othyus, Demetris Nichols, and Ryan Thompson all gave strong pre-season showings. It was the most competitive group of hopefuls that I can remember trying out for the Jazz. Sundiata was unfortunately stuck behind 3 solid guaranteed contracts at PG. Othyus had trouble shooting from the perimeter despite showing skills, activity and toughness in other aspects of his game. Nichols had two strong pre-season shooting nights. And Thompson was the one with perhaps the most "potential" of the group. I wouldn't be surprised if the Jazz keep each one of these guys on speed-dial for the next time an injury hits our team. Frankly, I like each one of them, especially Othyus and Ryan Thompson.